If you're a medium sized family who enjoys the whole camping experience, then you will want this 27BHS Autumn Ridge Outfitter. With features such as the double entry doors that promote a smooth flow of traffic in and out, to the spacious interior thanks to the single slide out you are sure to enjoy each camping trip. The rear set of double bunk beds can sleep four people so now your kids can bring along a friend! You will find enough room at the U- shaped dinette to comfortably seat your family for meals or a game or two after dinner, plus it can be transformed into an extra sleeping space at night. Inside the front private bedroom, you will enjoy a good night's rest on the queen bed with closets to keep your clothes from getting wrinkly. If you are looking for a compact trailer that is easy to tow, then you will want a Starcraft Autumn Ridge Outfitter travel trailer. Each model offers a different set of advantages to help you do camping your way! Along the exterior you will find nitro-filled tires, tinted safety-glass windows, and an outside shower, plus an electric awning with LED lights and speakers for you to crank up the tunes. Inside it is prepped for cable and satellite, stainless steel appliances, hardwood cabinets, and pleated shades for your privacy, plus a comfortable queen bed with a bedspread. You will also find that your meal prep will be a breeze in the kitchen with the three burner stove with a 17" oven, a microwave, and a range hood with a light and exhaust fan, plus you can store your delicious leftovers inside the 6 cu. ft. refrigerator, and your clean up will be even easier with the residential-style high rise faucet. 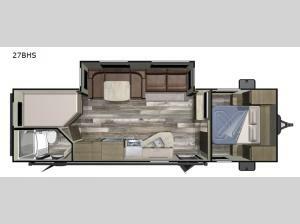 Come choose today the Starcraft Autumn Ridge Outfitter travel trailer model that best suits you!